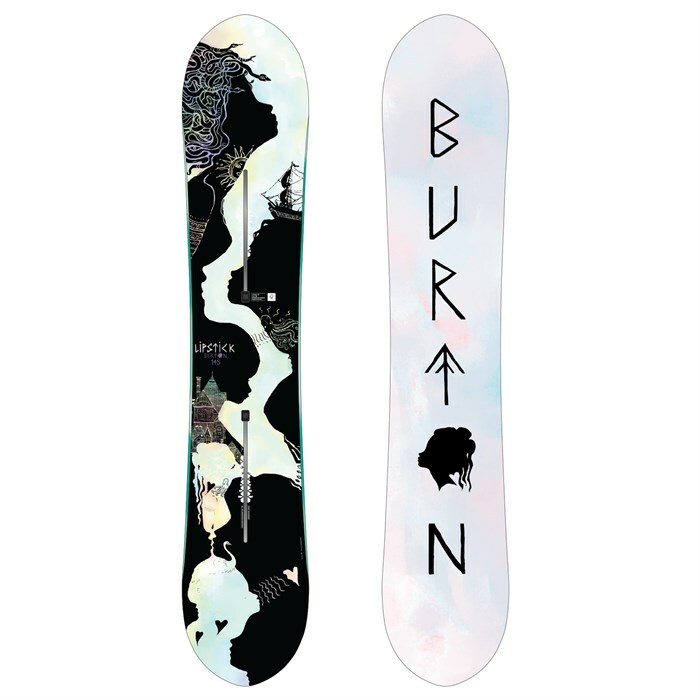 For the freestyle minded all-mountain shredder, the Burton Lip-Stick Snowboard offers a damp, catch-free ride that is equally at home in the park as it is in the reaches beyond the man-made features. This medium flexing deck rings in with a fully symmetrical shape and Burton s Flat Top™ camberline for a reliable freestyle-oriented feel. Take to the big line, turn the whole mountain into your personal terrain park, and rail with confidence on Lip-Stick. Flat Top™  A flat profile overall with subtle rocker rise provides an extra stable platform underfoot with a catch-free feel at the tip and tail. Happy Medium  A forgiving, user-friendly flex. Riders who use the entire mountain as their playground will benefit from this playful, versatile and damp flex. Twin Flex  Having a twin flex indicates that your board is perfectly symmetrical in flexibility from tip to tail so you gain a more balanced and predictable ride. Twin  Perfectly symmetrical for a balanced ride that’s equally versatile when ridden regular or switch. Jib, spin, stomp, and butter with a greater balance of freestyle mobility and cat-like stability no matter which way you point it. Side Effects  This patented design lengthens the surface area at the tip and tail contact points to improve edge-hold and allow the board to plane easier in pow. Enjoy a livlier feel and enhanced grip on groomers along with added float for overhead days. FSC™ Certified Super Fly II™ 700G Core  Strong and lightweight woods target specific areas of the core to provide pop, strength and reduce weight. FSC™ certification ensures that the wood products are harvested from well-managed forests that provide environmental, social and economic benefits. Dualzone™ EGD™  The wood grain is positioned perpendicularly along the toe and heel edges. Engineered Grain Direction provides you with consistent edge-hold and added strength. Squeezebox  Burton's Squeezebox improves your boards performance by balancing thicker more powerful core sections in with thinner more flexible sections. Meaning you get enhanced board connectivity, response and predictability. Triax™ Fiberglass  This laminate gives the board an asymmetrical flex with lengthwise stiffness. The result is a board that remains smooth and stable. Sintered WFO  Burton infused specially formulated wax deep into the pores of this extra-absorbent, high-density sintered material. The result is an ultra-durable base that stays fast and furious all season in any conditions. Frostbite Edges  The edges extend out slightly beneath your bindings for tremendous edge-hold on hard, icy conditions. Regardless of the conditions they make your ride easy, playful and always precise. Infinite Ride™  Burton-exclusive technology allows for maximum pop and strength by overbuilding the board, then putting it in a machine that breaks in the board for you. Whether you choose to ride Springloaded, Rocker, or Camber, rest assured that your board will maintain its flex, pop, and feel from the first day forward, season after season. Pro-Tip™  A tapered tip and tail thickness reduces swing weight for easier mobility and easier spins. The Channel™  Stronger, faster, easier, and more adjustable - The Channel™ gives you ultimate control of your stance and your board in a design compatible with all major binding companies (not just Burton’s). Rocker/Flat/Rocker Rocker/Flat/Rocker is another variation on the rocker theme that seeks to provide a little more hard snow edgehold and pop than full rocker while retaining ease of turning and float. Performance is between a fully rockered board and a flat board.